Born in nearby Sherman, TX G.A. Miller has been fishing Lake Texoma his entire life. 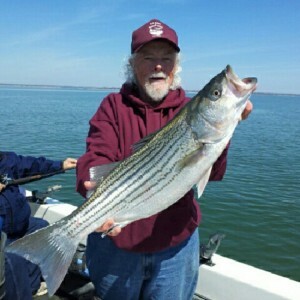 He and his wife Linda went fishing on their first date over thirty years ago and have enjoyed Lake Texoma together ever since. He spent 27 years in the banking industry before beginning his career as a professional fishing guide in 1987. During his banking he spent most of his free time fishing tournaments on Lake Texoma and surrounding lakes. During this period he caught one lake record and one state record fish. Since he began professionally guiding his clients have boasted two lake records and one state record fish. As a member of the Pottsboro Chamber of Commerce, G.A. served terms on the Board of Directors, been Treasurer, and has been involved in the Chamber’s Tournament Committee and Striper Day Benefit Tournament. As an active member of the Pottsboro Chamber of Commerce, G.A. has served terms on the Board of Directors, been Treasurer, and is involved in the Chamber’s Tournament Committee and Striper Day Benefit Tournament. With his life long experience and strong credentials you surely can’t go wrong with G.A. Miller as your guide. After moving to the Texoma area 18 years ago, Robert has spent every day he could fishing Lake Texoma and surrounding areas. As a third generation fisherman he has been slinging lures his entire life. In 2010 G.A. Miller took Robert under his wing and began teaching him everything he knows about Striper fishing. Robert has been working with him as a professional guide ever since. 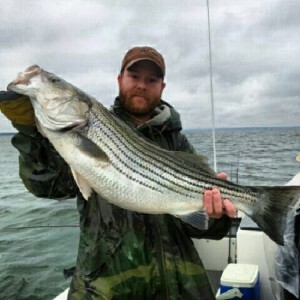 With a friendly inviting attitude and a fishing skill level far beyond his years Robert is now one of the top Striper guides on Lake Texoma. With Robert Clark as your guide you are sure to catch lots of fish and have a great time doing it.